A few of my students from my class last Saturday sent me pictures of their completed pieces. How fun! They all did a great job and it is such a treat to receive texts and emails with pictures of their pieces. Here is the eye candy! 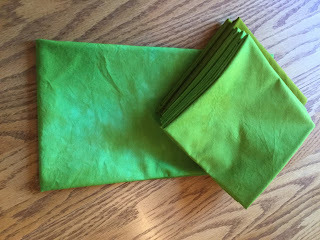 Pam Gantz did a great job on her gradient dye of Bright Green. She just did two stages of the gradient. Pam also ice dyed this piece with Chinese Red. Ice dyeing doesn't always bring out the strongest of the color because it gets more watered down, but I think this is beautiful! 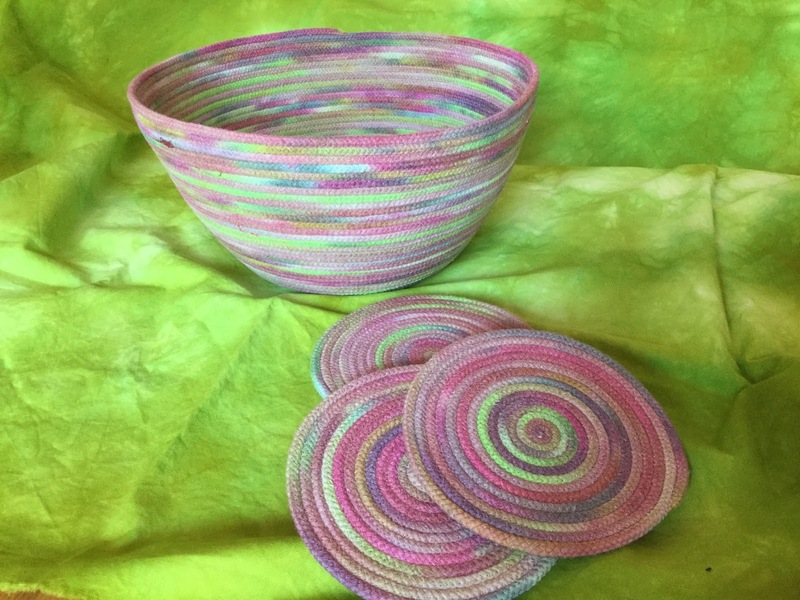 Pam used the product Color Magnet by Jacquard to get the tone on tone effect on these pieces. I haven't used this product. Pam watched an episode of The Quilt Show with Sue Bleiweiss and learned how the use the product. Great results! 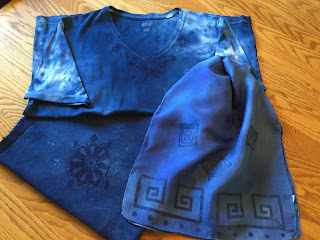 The dye color Pam used was Indigo. Pam also dyed cotton cording and made these cute mug rugs and bowl. She works fast because she emailed these pictures to me the day after the class. Pam said she begged dye from the other ladies when they were container dyeing and dropped it in a ziplock bag. She didn't let it mix too much so colors will absorb the way she dropped them in. I'm going to try this now and use the cording for my Etsy orders when I wrap them up. 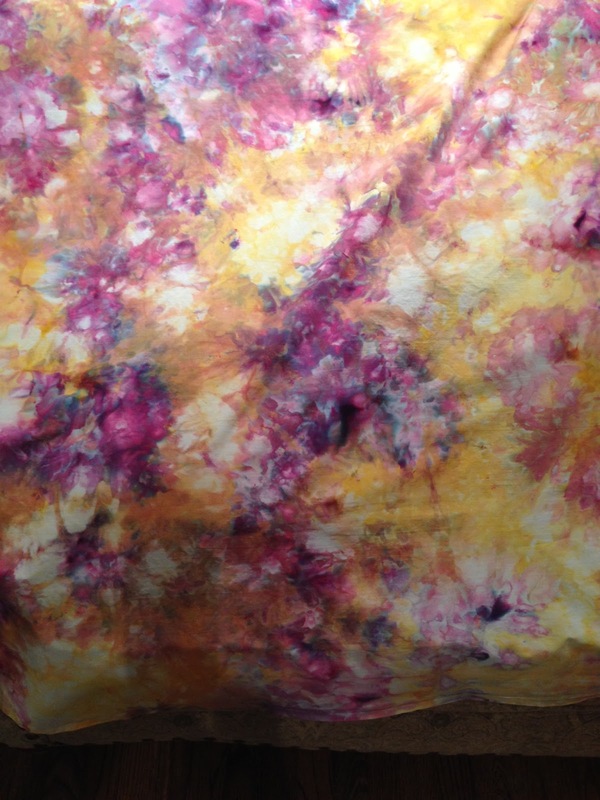 Patty Hofer created this iced dyed piece. The colors are excellent. It looks like something from the galaxy. It looks like she used Golden Yellow, Clear Yellow and Lilac. Well, I hope you enjoyed this show and tell as much as I did. 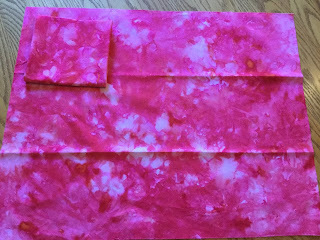 Don't forget to check out my Class and Workshop schedule for Dye classes and/or if you want to reserve time in the Open Dye Studio.